*I'll answer your inquiry quickly, usually within an hour. **If you're ready to book now, please click the 'Request to Book' button. If you'd like a quote, please click 'Send Message'. HONEYLOVE is a one bedroom cabin nestled on the side of Bluff Mountain, about 5 miles from downtown Pigeon Forge, approximately 8 miles from Dollywood and about 14 miles from Gatlinburg. It has easy access and a porch that surrounds you in natural beauty. So peaceful with privacy and gentle breezes whispering through the trees. Enjoy the Hot tub on your private porch or cuddle up by the wood burning fireplace. HONEY LOVE is a true log cabin with all the comforts of home. . . with fully equipped kitchen, flat screen tvs, and a king bedroom in the loft with all the seclusion you will need to celebrate your romantic getaway. If you like to ski, check out Ober Gatlinburg in downtown Gatlinburg! Cades Cove is not far, so if you're a nature lover or like old historical places, check it out. It is an 11 mile loop through a well preserved old settlement, with log homes, barns, and churches, along with an abundance of wildlife. If you're a fisherman, the Pigeon River is about 20 minutes away, and the National Park is about 30 minutes away. Some of the other many attractions include: Dollywood, Ripley's Aquarium in Gatlinburg, Tanger Outlet Mall, Great Smoky Mountain National Park. The Biltmore House in Asheville is not too far away, along with Harrah's Casino in Cherokee. **If this cabin is booked for your desired dates, check out VRBO #367295, #368064, or #617953, they are all 1 Bedrooms just like Honey Love in the same area. ***WE DO NOT REFUND BECAUSE YOU CANNOT GET TO THE CABIN DUE TO WEATHER OR ANY OTHER REASON. THEREFORE, WE HIGHLY RECOMMEND PURCHASING TRIP INSURANCE. **Rates are subject to change at any time before a reservation is confirmed. **Fireplace is in operation from October 1 to March 31st only. **We do not allow pets or smoking. My husband and I live in East Tennessee and love the Smoky Mountains. We enjoy sharing our cabins with our guests. We love Bluff Mountain, where all of our cabins are located. We knew this cabin is perfect for couples! Being tucked in the mountains but still close to everything in Pigeon Forge is perfect! Wood Burning - we do not provide wood. Enjoyed our stay again for the second time. Couldn’t figure out the first coffee maker. Second coffee maker stopped mid brew both times we used it. Downstairs bath needed a new light bulb. Up stairsbath needs a new fan. I do some cooking and couldn’t find a cutting board. Didn’t want to damage the counter. Couldn’t control the ceiling fan to circulate the heat. High was too cool for circulating the heat. Absolutely loved the new mattress!! !Thanks for another nice time. We had a blast! Thank you Lezlee!! We really enjoyed our weekend at the cabin. Great cabin away from all the crowds! Very private and intimate to share time with your honey! Great time! Loved the fireplace and the hot tub!!! The bed was a little too hard for our liking but overall, was VERY HAPPY WITH EVERYTHING ELSE. The kitchen and downstairs bathroom was great! Loved ALL THE DECOR throughout the cabin. This cabin was absolutely wonderful. We could not find one thing wrong with it. The location was absolutely perfect to everything that we wanted to do. Hot tub was great after a long day in the cold, bed was very comfortable, WiFi worked like a charm, cooking amenities were wonderful. Anything you needed was right there in the kitchen. Another added bonus: I came to th cabin with my boyfriend and we left engaged. We got engaged at your cabin and can’t wait to return and bring back some wonderful memories! Thank you so much for a perfect vacation in the Smoky Mountains! Congratulations! I wish you a lifetime of happiness in your marriage! The place was perfect it was clean beautiful and very much in the Christmas spirit. I was amazed I had a wonderful time and I would strongly advise any couple who wants to have a small getaway privately to themselves to come to this beautiful cabin. The owners are very friendly and respond to any quick questions at an immediate phone call. 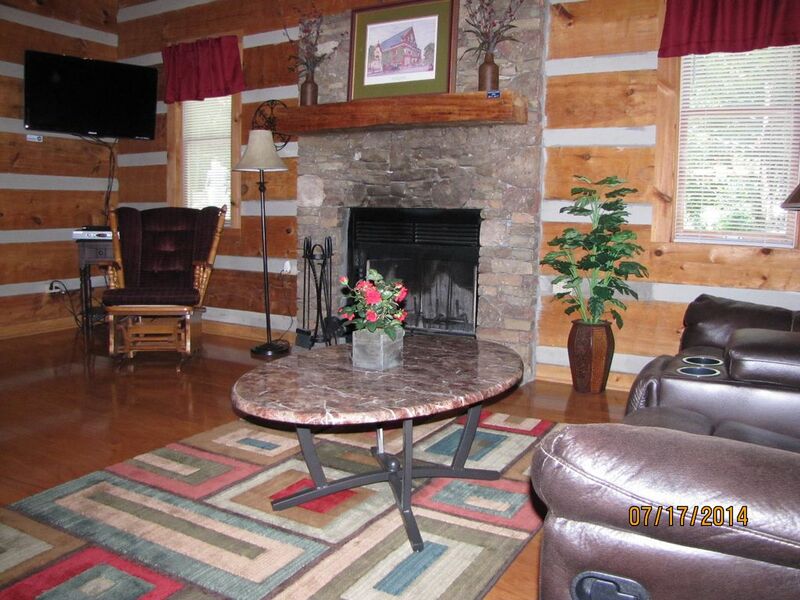 We enjoyed the jacuzzi and fireplace, as well as the near by cities: Gatlinburg Ang Knoxville. It was a true blessing to be able to be up here and enjoy my time thank you guys for making it happen.